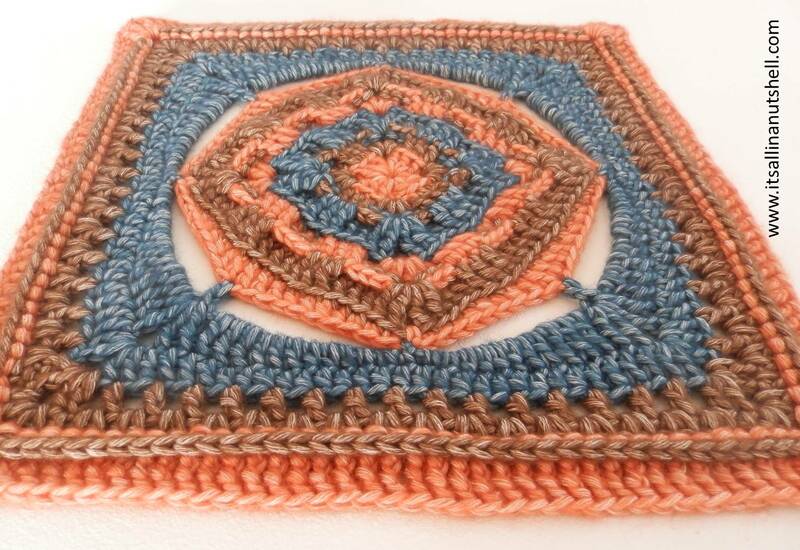 I have designed a 12inch (30cm) square especially for the first birthday of the CAL – Crochet A Long Facebook group. Can you believe this fun and supporting group with already 20.000(!) members is only a year old? To celebrate this wonderful event, many designers from all over the world have united to each designed a 12inch square so that all you wonderful people can make a “Friends Around the World” anniversary birthday blanket. You can find all the info about the “Friends Around the World” CAL in the CAL – Crochet A Long Facebook group. You can also post all your questions there and show your beautiful results. 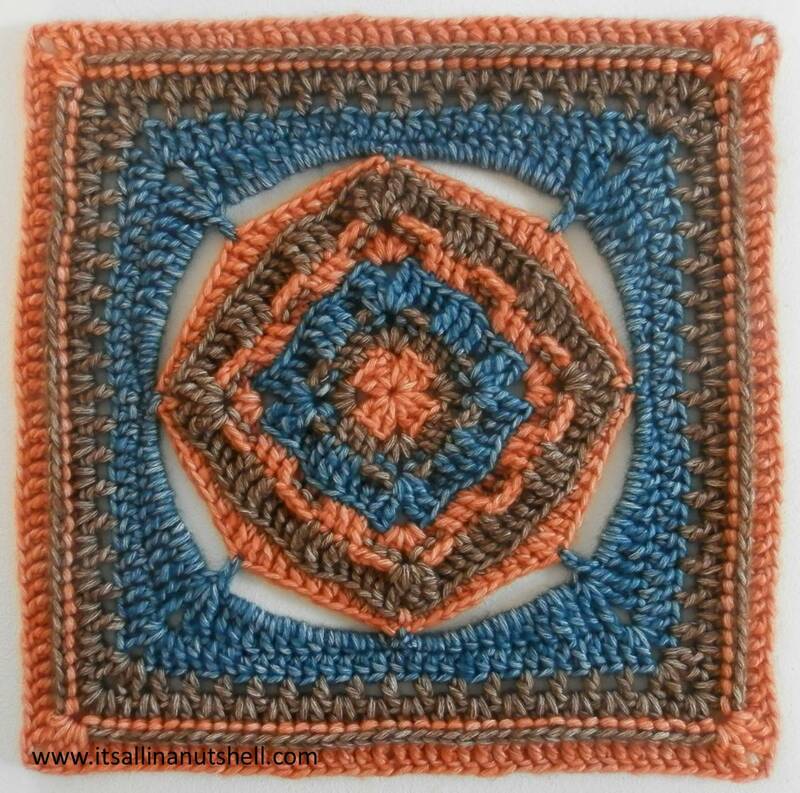 This is the first afghan square I have designed and because it’s my ‘first born’ square I named it after my first born son Stephan. Stephan was all chuffed to find out that I had named a square after him. Do you like “Stephan”? I’m really pleased with how it turned out. When counting stitches, the ch1/ch2 corner stitches do not contribute to the final stitch count. Only the stitches between the ch1/ch2-corner spaces are counted. Unless indicated otherwise, start each round in a ch1/ch2-corner space. If you find the written pattern hard to follow, you can follow the video tutorial in which I show step by step how to make “Stephan”. ch4, close with a sl.st. to the first ch. ch3, 2dc in the ring, [ch2, 3dc in the ring] times 3, ch2, close to the top of the ch3. If you use an invisible join here it will be easier to work in the back loops in the next round. Use color B. Work this round in the back loop only. [(2dc, ch2, 2dc) in the ch2-corner space, 1bldc in next 3st.] times 4. Close to the first stitch. Use color C. Note that in this round you will be working certain stitches as back post stitches. [(2tr, ch2, 2tr) in the ch2-corner space, 1bptr in next 2st., 1tr in next 3st., 1bptr in next 2st.] times 4. Close to the first stitch in the back loop only or use an invisible join. Use color A. Work this round in the back loop only. [(2dc, ch2, 2dc) in the ch2-corner space,1bldc in next 11st.] times 4. Close to the first stitch. Use color B. Note that in this round you will be working certain stitches as back post stitches. [(2tr, ch1, 2tr) in ch2-corner space, 1bptr in next 3st., 1tr in next 3st., 1bptr in next 3st., 1tr in next 3st., 1bptr in next 3st.] times 4. Use color A. Work this round in the back loop only. In this round the corner is formed by the sc in the ch1-space. [1sc in the ch1-corner space, 1blsc in next 3st., 1blhdc in next 4st., 1bldc in next 5st., 1blhdc in next 4st., 1blsc in next 3st.] times 4. Close, cut off and work away your yarn tails. Use color C. In this round you do not have a ch-corner space. The sl.st. counts as the corner space. Attach your yarn with a sl.st. in any sc worked in a ch1-corner space of round 5. [ch12, 1dc in the 3rd dc, ch12, sl.st. to next corner sc] times 4. Close with a sl.st. in the starting stitch. Do not cut your yarn. Use the same color yarn as in round 7. In this round you will create a new ch2-corner space. ch1, [(2sc, 3hdc, 3dc, 3tr) in the next ch12-space, (2tr, ch2, 2tr) in the next dc, [(3tr, 3dc, 3hdc, 2sc) in the next ch12-space, sc in the next sl.st.] times 4. Close with a sl.st. to the first sc (not the ch1). Do not cut your yarn. ch2 (counts as 1hdc), 1hdc in next 8st., 1dc in next 4st., (2dc, ch2, 2dc) in the ch2-space, [1dc in next 4st., 1hdc in next 19st., 1dc in next 4st., (2dc, ch2, 2dc) in the ch2-space] times 3, 1dc in next 4st., 1hdc in next 10st. Close with a sl.st. to the ch2 or make an invisible join. [(2dc, ch2, 2dc) in ch2-space, (ch1, skip next st., 1dc in next st.) times 15, ch1, skip last st.] times 4. Close with a sl.st. to the first st. Do not cut your yarn. sl.st. to the next st.
ch3 (counts as 1dc), (2dc, ch2, 2dc) in the ch2-space. [skip first dc, 1dc in next st., (2dc in next ch1-space) times 16] skip the next st, 1dc in last st.] times 4. Close with a sl.st. to the ch3 and cut your yarn. Before continuing, take a moment to measure your square. If you are already close to 12 inches you might have to replace the tr in this round for dc or maybe even hdc if you have a very loose tension. If you are still ‘miles’ away from 12 inches, work tr in this round and also work round 13. Note that in this round you will be working back post stitches. [(2tr, ch2, 2tr) in ch2-space, 1bptr in every st.] times 4. Close to the first st. with an invisible join. This round is optional and depends on your personal tension. 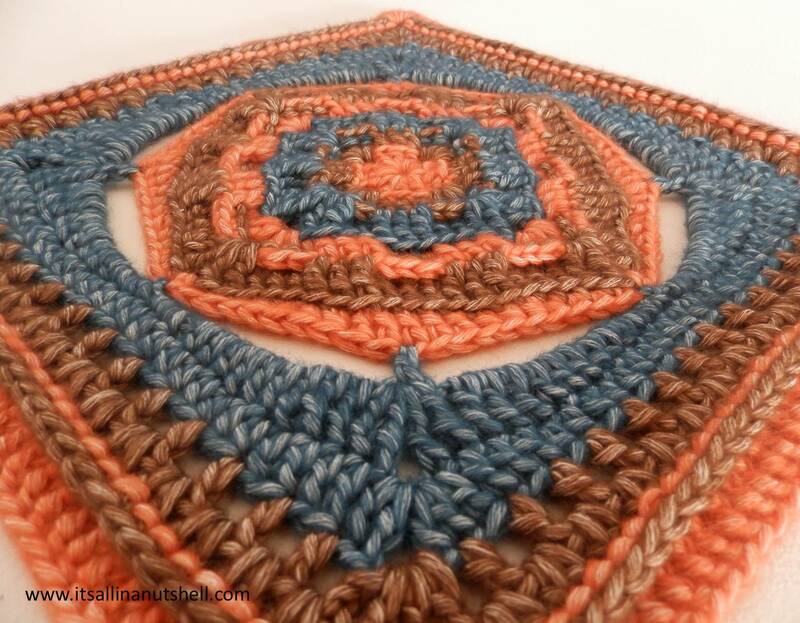 If you are a tight crocheter your square might not be 12 inches yet, then make this round to get your square to the right size. If your square is already 12 inches, stop. Do not make this round. You might have to replace the dc with either hdc or tr, depending on your personal tension, to get your square exactly 12 inches. [(2dc, ch2, 2dc) in ch2-space, 1bldc in every st.] times 4. Close to the first st.
Pingback: Week 3 – Stephan! – Crochet Along with us! Where can I get help with this square? Row 9 is not matching up to Row 8. In row 8, you make 2sc+3hdc+3dc+3tr, then 2tr before you make the corner 2ch. That makes 2+3+3+3+2 =13. Then in Row 9, you say ch2 = one hdc, then 1hdc in 8 st and 1 dc in the next 4. that makes 12. there’s a stitch left over. Or do you start the first of the 8 hdc in stitch *2* of the row below and not stitch 1? Have you considered watching the video? I am sure that will help to get the bug out of your work. Wonderful work Esther, thank you for sharing this with us.